Russia on Sunday held a successful test flight of its new MC-21 medium-haul passenger jet that it hopes will revive its troubled civil aviation industry and challenge giants Airbus and Boeing. The plane, whose prototype was unveiled last June, flew for 30 minutes at a height of 1,000 metres and a speed of 300 kilometres (186 miles) per hour, said its makers, the Irkut Corporation aircraft manufacturer. The plane took off from the Siberian city of Irkutsk where the Irkut company is based, said Deputy Prime Minister Dmitry Rogozin, writing on Twitter. Rogozin, who oversees aviation and space, wrote as he watched at the scene: "We're flying!" President Vladimir Putin's press secretary Dmitry Peskov told RIA Novosti state news agency that Rogozin "by phone reported to Putin that our medium-haul plane took wing, carrying out its first test flight." 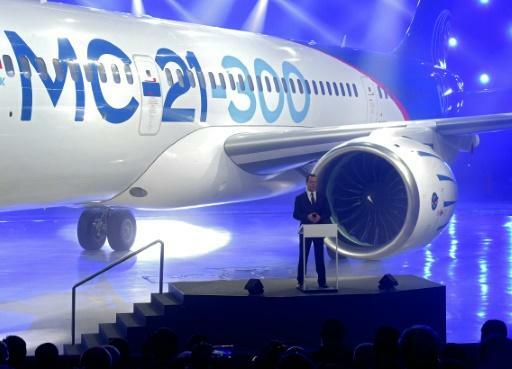 The president of Irkut, Oleg Demchenko, said in a statement that "today is a historic day for our staff and for all the big team that worked on creating the MC-21." The jet was piloted by two of the country's most decorated test pilots, Oleg Kononenko and Roman Taskayev. Kononenko, who has been awarded the Hero of Russia medal, said that the "flight assignment was completed fully" and the "flight went normally." "There were no negative points identified that prevented the continuation of the tests," Kononenko was quoted as saying by the company. Rogozin posted on Twitter photos of workers tossing one of the test pilots into the air after the flight. The MC-21 can carry up to 211 passengers and is designed for the mass-market travel industry. It can fly up to 6,000 kilometres (3,700 miles), according to the makers. Russia has its hopes set on competing with the Airbus A320 and Boeing 737, which dominate the international civil aviation market. Prime Minister Dmitry Medvedev said last year he hoped the new plane "will compete with other countries." The makers promise a "new level of comfort" for passengers thanks to the largest fuselage in the plane's class and large windows. Irkut says it has signed contracts with a number of airlines, including Russian flagship carrier Aeroflot, UTair and the Kyrgyzstan Air Company. Rogozin said last week the company has 185 firm orders for the plane, quoted by RIA Novosti. The maiden flight comes six years after Russia's short-haul Sukhoi Superjet aircraft came into service in 2011. They have since suffered serious technical issues that have forced the plane's grounding.